This is a project which asks students to research and explore the role that Parks and Green spaces play in the city. This topic could be thought of generally, with Bristol as a case study, or be specific to a particular Bristol park or neighbourhood. The student would identify specific issues or topics of interest regarding parks and green spaces, from a practical, report-oriented approach, to ones more political or philosophical. For example, a survey-oriented approach could examine the relationship of parks and young people, how to increase numbers of public spaces, examine the increasing phenomenon of private-public spaces, explore questions of who uses which parks and why, wildlife management, funding issues, the changing (or not) role of parks in communities, parks and public spaces management structures, etc. An environmental or political approach could look at parks and green spaces more broadly, exploring issues such as deforestation, re-wilding, pollution, land use issues, land ownership, budget cuts, political transparency in decision-making, neighbourhood wealth and park quality, etc. Or one could take a philosophical view or psychological or sociological study, gathering information on the role that parks and green spaces play in human health and psyche, their role in cultural relationships and cultural production, urban planning, food production, etc. The end result could be an article, a report, a set of research, a news feature, a film or documentary, radio show, podcast, set of photographs, or a performance. For work focussing on individual groups, sites and/or bigger picture issues, Bristol Parkhive can assist by putting you in touch with relevant groups and interviewees, local histories, knowledge and access to reports, etc. 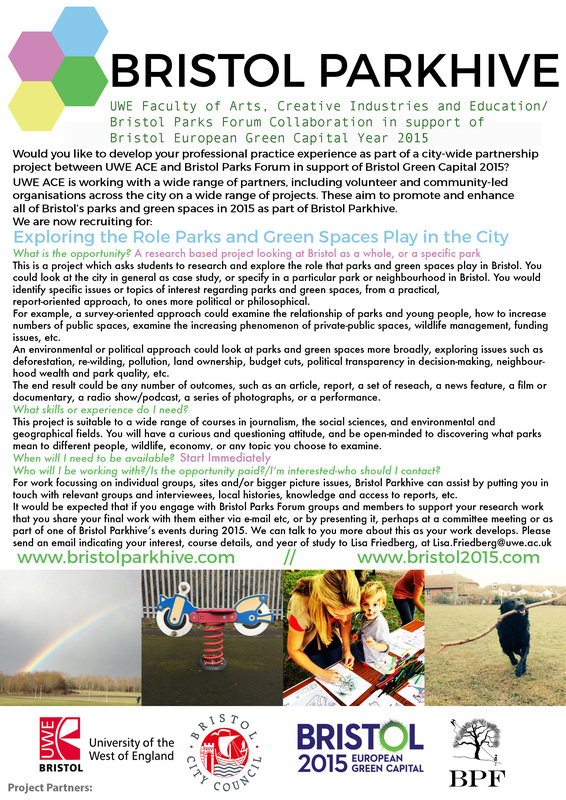 It would be expected that if you engage with Bristol Parks Forum groups and members to support your research work - you share your final work with them either via e-mail etc, or by presenting it, perhaps at a committee meeting or as part of one of Bristol Parkhive’s events during 2015. We can talk to you more about this as your work develops. Suited for: This project is suitable to a wide range of courses in journalism, the social sciences, and environmental and geographical fields.